Frequently and alternatively called the Camp Logan Mutiny, this riot and mutiny remains the largest mutiny and murder proceedings in American history. It was 1917 in Texas, which still had Jim Crow laws on the books, and the soldiers who were stationed at Camp Logan, just outside of Houston, reached a boiling point after several African-Americans were beaten and arrested by the police. In 1917, shortly after the United States declared war on Imperial Germany, the War Department ordered the Third Battalion of the 24th United States Infantry Regiment, an all-black unit of the famous Buffalo Soldiers, to guard the construction site of Camp Logan in Houston, Texas. At that time, the armed services were segregated, and racial discrimination was accepted in many places in America. Texas was one of them. On the afternoon on August 23, two policemen fired a warning shot before they burst into the home of a black woman saying they were looking for a man who was accused of participating in a gambling venture. The police accused her of harboring the man and dragged her, barely clad, into the street. Her five children watched as their mother was assaulted in the street. A crowd began to assemble, and Alonso Edwards, a soldier from the 24th Infantry, was among the crowd. He asked patrolman Lee Sparks what was happening and asked if he could fetch the woman some clothes. Sparks pistol-whipped Alonso Edwards, beat him to the ground, and arrested him for "interfering with the arrest of a publicly drunk female." Later in the afternoon, Corporal Charles Baltimore, a military policeman from the 24th, went to the police station to try to get Edwards released. The discussion he was having with the police turned violent, and Corporal Baltimore was himself shot at, beaten, and arrested. He was released a bit later, but the men at the camp were unaware of that fact, and rumors that Baltimore had been beaten, or possibly murdered by the police flourished. As things began to get out of control at the camp, a battalion commander ordered all soldiers to be confined to the camp. He then ordered four first sergeants to collect all ammunition and rifles. A group of 156 soldiers, angry at the violence and racism, marched on the City of Houston intending to storm the police station and free their comrade. Before they left, however, they stole guns from the supply tent. Reportedly, one of the first sergeants, Vida Henry, joined the angry mob of soldiers. The police and citizenry of Houston had heard reports of a mutiny and made their way, armed as well, toward the camp. As the soldiers marched toward the police station, they fired into the night after someone shouted, "Here they come!" A white child was hit by a stray bullet and died. An Army Captain was the next victim, and there is speculation that he was mistaken for a policeman. Then one of the policemen who was involved in the beating and arrest of Corporal Baltimore was killed. Around this time, many of the soldiers fell away from the marching mob, some hiding and some heading back to camp. First Sergeant Henry dropped out and was later found dead from a self-inflicted gunshot. The ensuing riot left four soldiers, four policemen, and twelve civilians dead. Martial law was declared, and two days later, the battalion was on a train back to New Mexico. When they arrived, 118 of the soldiers were arrested, charged with mutiny and murder, and taken to the stockade in El Paso, Texas at Fort Bliss, where they awaited their courts martial. The rest of the unit was transferred to the Philippines. In all, 198 witnesses -- 169 for the prosecution and 29 for the defense -- testified, including seven of the soldiers who agreed to testify after being promised clemency. In all, three separate courts-martial were conducted. The first was held at Fort Sam Houston in San Antonio. The proceedings were held in the chapel, which could only hold trial for 63 men. All of them were represented by one lawyer, on charges of disobeying orders, aggravated assault, murder, and mutiny. On November 28, thirteen of the defendants were sentenced to be hanged on December 11, though they themselves were not told of the sentences until December 9. Life sentences were given to 41 soldiers, four were given shorter sentences, and five were found not guilty. The gallows were hastily built, and at 7:17 in the morning, one minute before sunrise, they were hanged, all at the same moment. "The doomed men were taken off the trucks, not one making the slightest attempt to resist...The unlucky thirteen were lined up...As the ropes were being fastened about the men's necks, big (Private Frank) Johnson's voice suddenly broke into a Christian hymn -- 'Lord, I'm Comin' Home' -- and the others joined him. The eyes of even the hardest of us were wet." After this incident, a new military rule, General Order No. 7, was issued, mandating that all death sentences would be suspended until the President of the United States officially reviewed all of the pertinent records. 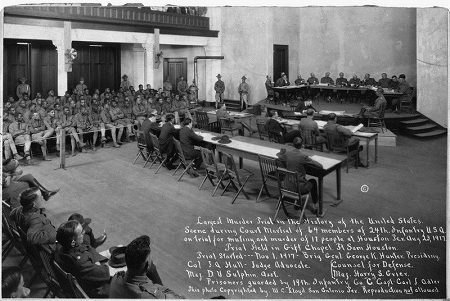 Then the second court martial -- with 15 soldiers standing accused -- took place from December 17 through December 22, 1917. Five of them were found guilty and sentenced to death. The third took place from February 18 until March 26, 1918, with 40 soldiers standing accused. Eleven were sentenced to hanging and the remainder to life in prison. So, in all, 118 enlisted men were court-martialed for having taken part in the mutiny. 110 of them were found guilty: 29 were sentenced to die for their participation and 81 were sentenced to spend the rest of their lives in prison. President Woodrow Wilson commuted the death sentences of ten of the condemned soldiers to life in prison. He publicly said that he had affirmed the death sentences of the six remaining soldiers as their was "plain evidence" that they had participated in the brutal riot. And so it was that five more soldiers were hanged at dawn, and the sixth and final condemned man was executed a week later, again at dawn. While looking into the history of the 24th Infantry for this article -- once part of the legendary Buffalo Soldiers -- I did not run into a single piece of writing which did not mention the riot and mutiny, though there are a few which refer only fleetingly to "the trouble in Houston." The area where Camp Logan was situated is now an upscale neighborhood called Memorial Park and has nothing more than a single marker to commemorate what happened there in 1917. Subtitled "The Lynching of Black Soldiers in the World War I Era," this dissertation has a chapter dedicated to the Texas race riots, including Fort Logan as well as the Brownsville riots. This section of African Americans and World War I is about the Houston Riots and mutiny as well as the results of that chapter in history. This is a collection of records regarding one of the largest race riots in United States history, the riots at Camp Logan. This manuscript, 23 pages in length, delves deeply into the Camp Logan riot and mutiny. One may read the entire manuscript online for free or pay $24.00 to download it. Search for Houston Riot & Mutiny on Google, Bing, or Yahoo!